I am on the wait list for Wolf Whiskers and I became aware that besides choosing a knot from the WW website, you can send Peter a knot of your choice from somewhere else. I don't mind spending extra for a quality, top notch knot. 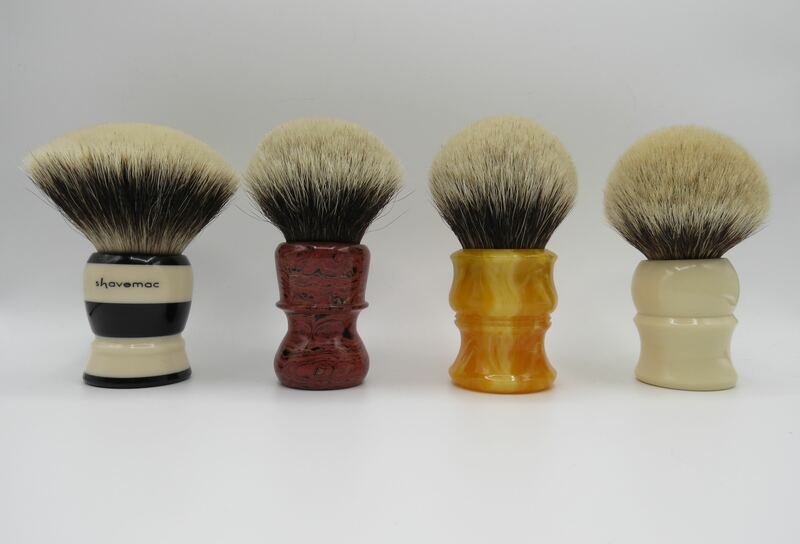 What would be some suggestions on where to look for some high end badger/manchurian knots? Shavemac makes some great knots. (01-20-2019, 05:54 PM)UngerWoo Wrote: Shavemac makes some great knots. Good suggestion. I had my two Declaration Grooming knots installed in third-party handles, and enjoy them very much (although they’re quite pricey). Envy Shave. Either the Luxury Silvertip or the Envy White Supreme. The Luxury is super soft tips yet nice backbone. The White gives just a touch more scritch. Peter did a custom for me about three years ago using a Shavemac two band silvertip knot. I'm pleased. Shavemac knots are excellent, but pricey. If you don't want to spend the cost of a Shavemac, consider Bob Quinn / Elite Razor. His Manchurian White (2 band) and High Mountain White (3 band) knots are also excellent. 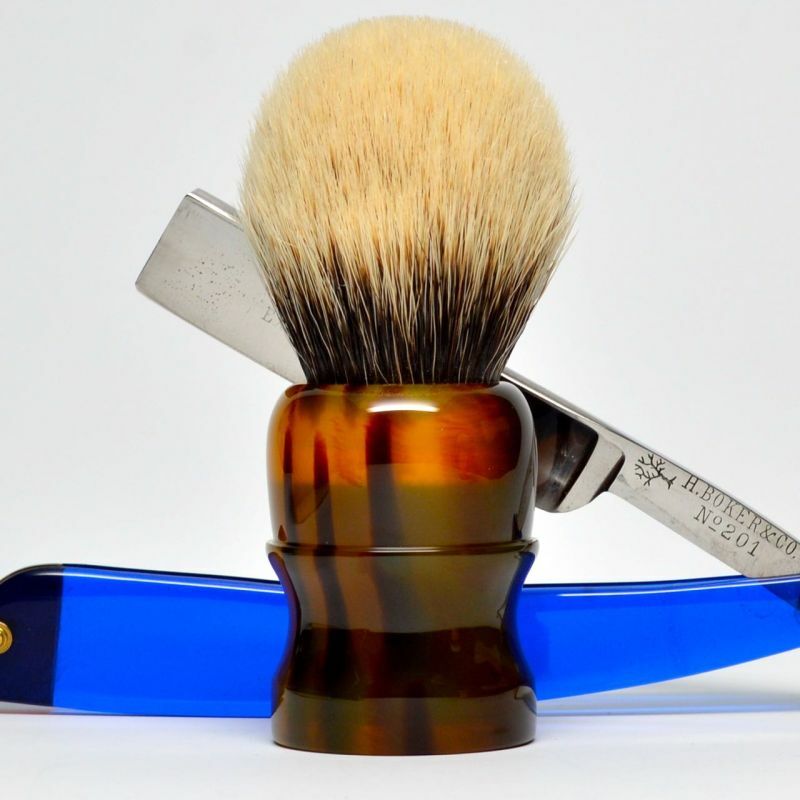 I've tried TGN, Envy Shave and WSP, and prefer Bob's knots by a substantial margin. (01-20-2019, 08:32 PM)TheLegalRazor Wrote: Shavemac knots are excellent, but pricey. If you don't want to spend the cost of a Shavemac, consider Bob Quinn / Elite Razor. His Manchurian White (2 band) and High Mountain White (3 band) knots are also excellent. I've tried TGN, Envy Shave and WSP, and prefer Bob's knots by a substantial margin. This is good to here hear. Bob will be making a custom for me using his Manchurian White. This is good to here. Bob will be making acustom for me using his Manchurian White. Great choice. I expect you'll be very happy with the brush. Please post pictures when it arrives! I have 5 of Bob's brushes, they are great brushes. The Manchurian White will not disappoint. Thanks for the great feedback. I have a couple of Elite Razor brushes and and very happy with them. A 28mm manchurian white bulb knot from Bob Quinn goes for $70. Something similar from Shavemac is around $150 (without shipping). Is the Shavemac knot really worth it? (01-21-2019, 05:52 AM)petropn Wrote: Thanks for the great feedback. I have a couple of Elite Razor brushes and and very happy with them. A 28mm manchurian white bulb knot from Bob Quinn goes for $70. Something similar from Shavemac is around $150 (without shipping). Is the Shavemac knot really worth it? One of my Wolf Whiskers has an Elite Manchurian White (Bob Quinn). I sent it to Peter when I was on the waitlist. They are outstanding knots. My other WW is one that Peter offered after an event. He had already set a TGN High Mountain White into it. I was pleasantly surprised because I have heard mixed reviews on TGN knots. It is excellent; densely packed with very high quality hair and it has never shed a single one. I've also had a couple of Shavemac knots. Very good, but expensive. I'd go with Elite. Yes! I give my vote on this! I own an Elite Razor Manchurian and could not be happier with it. It is a wonderful knot made to his specifications. It is a substantial value! +2 here. Shavemac is excellent regardless of the knot you choose. Go with Finest if you want to save on costs and have a good brush with decent backbone and softness. To me it is well worth it. I've tried countless knots you can buy from other places, and they just don't do it for me typically. For others the cost difference might not be for them, and that's fine. Ultimately you're the only one that can decide whether the cost of a Shavemac knot is worth it. This is all subjective. Whatever it is about the bigger name brands, there's something there I notice, and I appreciate it and feel the cost is worth it. That's not to say you can't find good options from places that have been mentioned for buying knots from as there are some sleepers in there and it might just be what you want. Get a Fanchurian from ThatDarnRob. Shavemac is excellent regardless of the knot you choose. I've never used one of their lower end knots, but I've heard they are very good. I have a 2 band "Unique" knot that is incredibly dense and firm. I had a D01 Silvertip that was probably the best three band I've used, but my CH2 Super is close. Unfortunately that D01 knot started to shed after about a year and a half in the rotation. Both of my Shavemacs had a long break in period, especially the unique. Lovely lovely brushes the Shavemacs. Lately for me the bigger the better. An old photo I've taken. Too many to take them together in the lightbox. Missing is a 30mm Silvertip, 28mm D01 3-band, 28mm? Flat-top D01 2-band (Profile pic), and a 25mm 3-band D01 (it's loft makes it closer to a 28mm in feel). I've gotten pretty much every grade Shavemac offers in a 28mm+ size, and figure I should finish it off and get a large Pure and Finest. I've experienced both of those in the past and had no problems either. Funny thing is in the photo below I am not the original owner of any of those brushes. Neither are the 3-band Silvertip and 3-band D01's. Guess if I really wanted to make the set complete I'd buy the pure and finest second hand. I am going to be honest with ALL of you. I actually like Bob’s “STANDARD” knots better than the premium knots! I don’t know why they are called standard but they are fantastic. 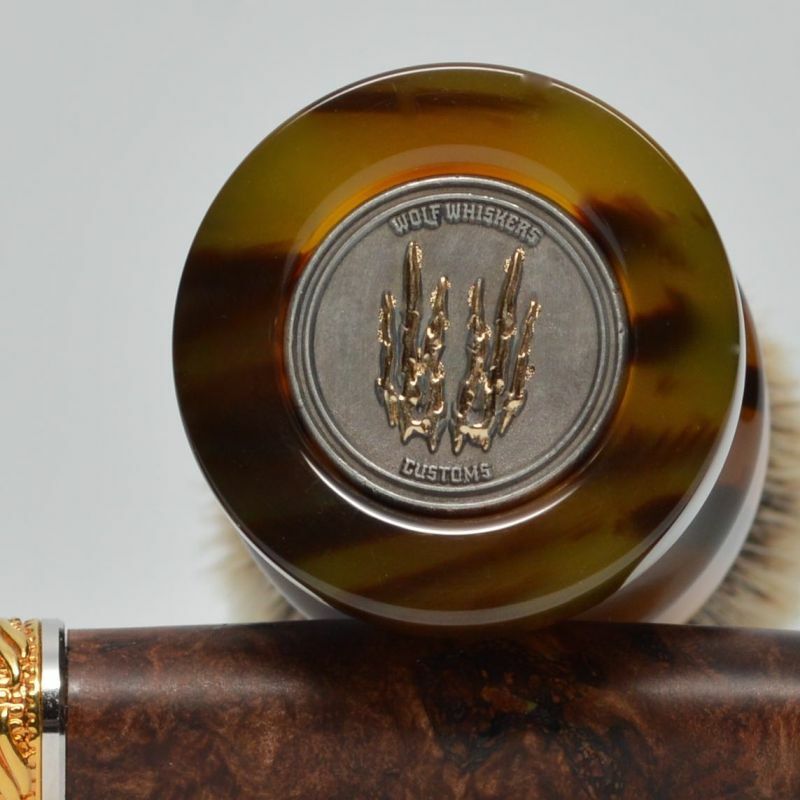 I purchased a 26mm Standard fan knot and sent it to Peter at Wolf Whiskers for my custom brush a few weeks ago. PERFECT! M&F Lee Sabini either one ( bulb, fan or hybrid knot ) Thater 2 band bulb and Shavemac 2 band . All good knots with super soft tips awesome flow through quality badger hairs that never shed .